Guys, this might be one of my most ambitious creations to date. 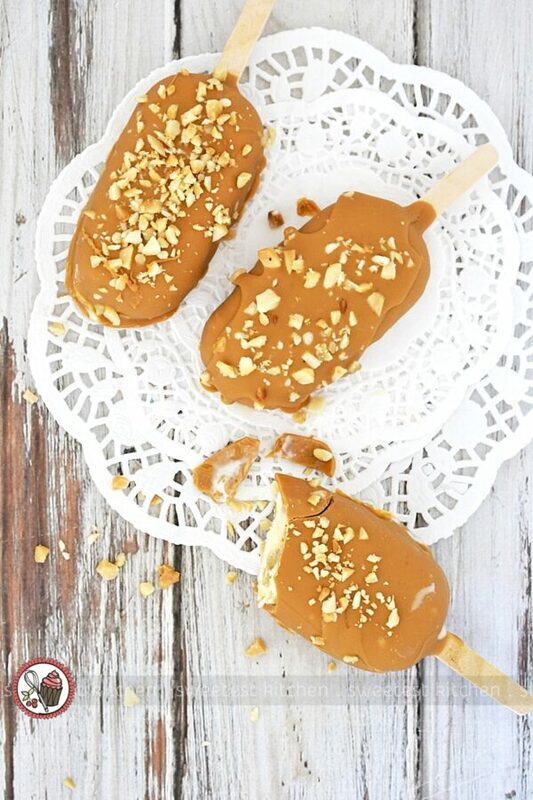 It took about two weeks to gather ideas for these ice cream bars and paint a picture in my head of how I wanted them to taste and look (yeah, see, I could never do MasterChef; I can’t create recipes in the blink of an eye!). 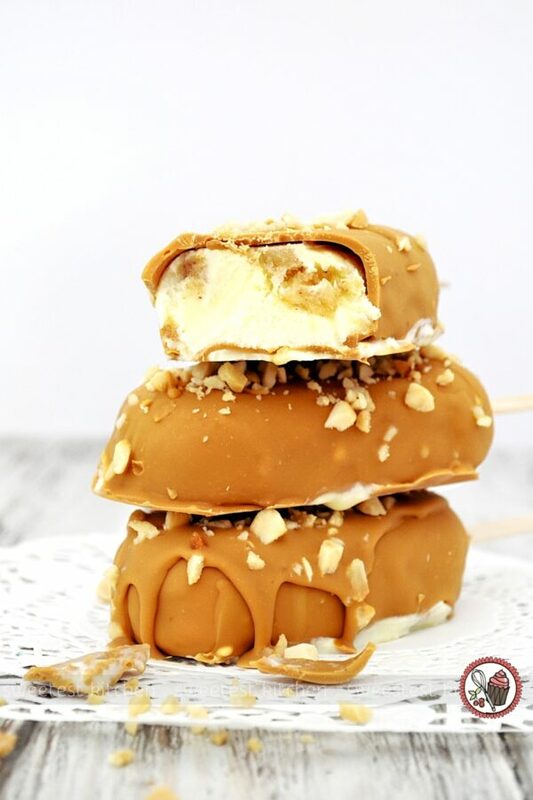 I’m quite proud of how they turned out and am super excited to share with you the steps to make these golden-coated ice cream bars! I created these (very rustic) ice creams for The Ginger People; please see my previous post for more details on The Ginger People (plus discover a recipe for Ginger Granola!) and why I have created recipes with their products. I decided I’d buy a set of Magnum-like Silikomart Silicone Easy Ice Cream Bar Molds to make the ice cream bars really fun to eat. I’m sure I’ll be using these molds again and again for future ice cream recipes! 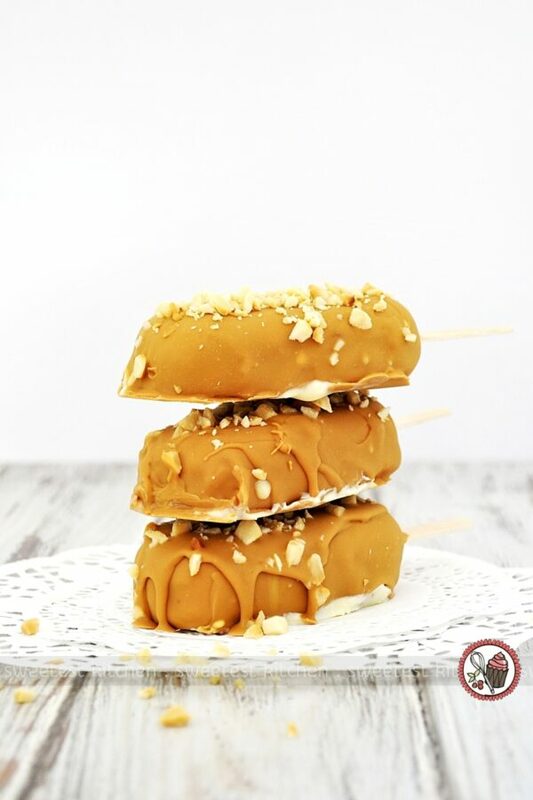 A quick run down on what these ice creams are… Zingy ginger ice cream swirled with bourbon-, cinnamon- and vanilla-roasted pears, coated in a caramelised white chocolate magic shell and sprinkled with toasted macadamias. Wow, right!? Ginger is one of my most favorite ingredients to cook with and ginger needed to be the star of these ice creams. I used The Ginger People Organic Ginger Juice in my very-simple, egg-free ice cream base. 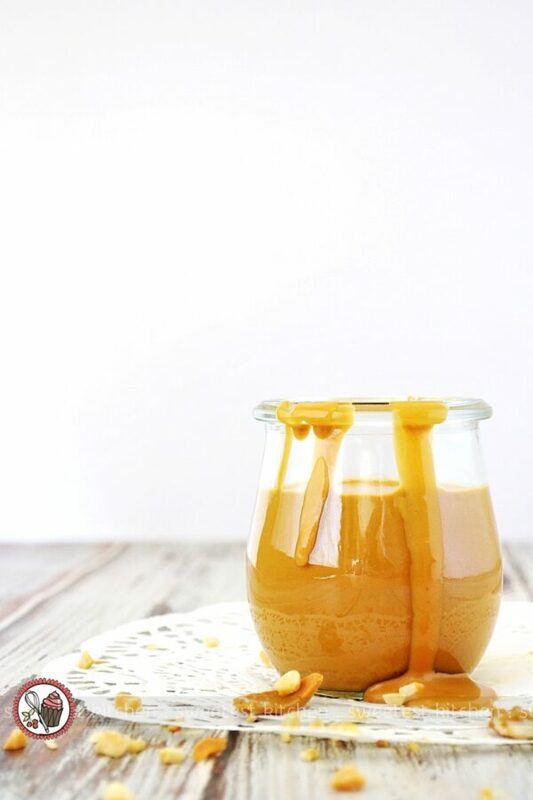 Ginger Juice is a time-saving alternative to fresh ginger or ground ginger, plus it completely eliminates the need to strain ginger pieces out of the ice cream base. As I previously mentioned, this is a really easy, egg-free, ice cream recipe, consisting of just a few simple ingredients – thickened cream, whole milk, caster sugar and ginger juice. This mixture is cooked over a stove, then cooled overnight in the refrigerator before churning it in an ice cream maker the next day. Pears go really well with ginger and I thought they’d make a lovely addition swirled into the ice cream. The only pears I could get a hold of were boring Packham pears, but I would have used Beurre Bosc pears had our store had any. I cut the pears into small cubes, about half a centimeter, and tossed them with a bit of lemon juice, caster sugar, brown sugar, flour, ground ginger, ground cinnamon, ground nutmeg, salt, bourbon and vanilla bean paste. I roasted the whole concoction in the oven at 180C for about 25 minutes. The sugars and flour made a gorgeous sticky sauce while baking; perfect for swirling into the ginger ice cream! Caramelised white chocolate. Oh, where do I even start? How can I even describe this! This is something I’ve always wanted to do. The process of caramelising white chocolate is easy, but annoying and time-consuming. Basically, you just chop up *high quality* white chocolate, place it all on a baking tray and roast it at a low temperature, stirring every 10 minutes. It took nearly 2 hours for my white chocolate to caramelise, but wow, was it ever worth it! This stuff is seriously liquid gold. The cat’s pyjamas. The bee’s knees. It is amazing. To make a magic shell out of this caramelised white chocolate, I added a bit of coconut oil. For the last component of these ice cream bars, toasted macadamias. It took two days to make these ice cream bars (those who follow me on Instagram got to see the progress through these two days). First day, cooking the ice cream and roasting the pears. Second day, caramelising the white chocolate and toasting the macadamias. I also churned the ice cream first thing in the morning on the second day, then poured the ice cream into the molds and swirled through the roasted pears. I could have, and should have, stretched it out to three days, but I was so excited that I decided to try to finish the ice cream bars late on the second day. That afternoon, after the ice cream bars had (hopefully) set, I dipped them into the caramelised white chocolate magic shell and sprinkled over the toasted macadamias, then waited until the third day to photograph and taste. Every component to this recipe is quite easy; anyone could do it. But, as I decided to rush a bit on the second day and dip the ice cream bars (I originally planned on waiting until the third day to dip), I wasn’t fully concentrating, and things started to get a bit tricky. My caramelised white chocolate magic shell was slightly too warm, so when I dipped the ice cream into it, the ice cream started to melt and some of the magic shell just slid straight off the ice cream. This is why the magic shell coating on my ice cream bars look a little… um… messy! I had to patch up some parts where the magic shell was missing. As you may know, magic shell hardens pretty quickly, so I didn’t quite get as many toasted macadamias onto the magic shell as I had originally wanted before it all hardened up. So… on to the third day. I photographed the ice cream bars, and sampled half of one. Oh… wow. I was quite blown away, actually. It tasted much better than I had even imagined it would. I was so excited that I informed my friends I’d be sharing these at school pickup (if you follow my Instagram, you might know that I regularly bring things that I bake/make to school pickup and share with the other moms there!). I packed one of the ice cream bars up into an insulated bag with ice packs, plastic bowls, spoons, knifes, napkins and trotted off to school pickup, excited to hear what the other moms thought of it. At our meeting place (a picnic bench at the school play area), I cut the ice cream bar into four pieces and shared with four of the moms. I sat in quiet anticipation and watched their faces (I should have gotten a photo of everyone with their ice cream bowls!!)…. THEY LOVED IT! YAY!!!! They absolutely loved it, and I was absolutely stoked! I mentioned above that ginger had to be the star of these ice cream bars, and there’s no doubt that it was. That lovely zingy ginger flavor was above all the other flavors. The boozy pears subtly sat in the background, with a quiet hint of cinnamon. As you could imagine, the caramelised white chocolate was the second big flavor in these ice creams. The entire thing is coated in a layer of it, and this is where a lot of the sweetness came from. It was a sort of toasty-butterscotchy flavor; definitely white chocolate, but … it’s just indescribable. I … can’t describe it, but I just love it. The toasted macadamias were subtle, but I liked how their unique nuttiness mingled with the rest of the flavors. It’s quite a complex mix of flavors, but it was just spectacular. Basically, these ice cream bars are like the ultimate flavor explosion. Yes, they took ages to make, but they were totally totally worth it. If you’d like to tackle this recipe, you’ll notice there are a lot of steps. Don’t be concerned, as the individual recipes are very easy; it’s just that it takes a bit of explaining to make sure you understand how to make everything! If you’re using a set of 4 Silikomart molds, you will have quite a bit of leftovers, especially with the caramelised white chocolate; you need to have a lot of this, however, to dip the ice creams into to ensure you can do it quickly and in one go, instead of dipping and re-dipping and spooning the magic shell onto the ice cream, for example. To make things easier, if you’d rather not make ice creams or popsicles at all, just make all the components and serve in ice cream bowls. For example, after you churn the ginger ice cream, transfer it to a freezer-safe container, swirling through the roasted pears. When it’s time to serve, scoop out the ice cream into bowls, then pour over the caramelised white chocolate magic shell and sprinkle on the toasted macadamias. I hope you enjoy these ice creams as much as my friends and I did! If you have a go, let me know what you think and be sure to share a photo! Zingy ginger ice cream swirled with bourbon-roasted pears, coated in a caramelised white chocolate magic shell and sprinkled with toasted macadamias. Be sure to read through the complete instructions before beginning; you'll need to begin this recipe 1-3 days (depending on the time available to you) ahead of the time you'd like to enjoy them. For the ginger ice cream: In a medium saucepan, whisk together the cream, milk, sugar and Ginger Juice (you can use more or less Ginger Juice to suit your taste). Bring the mixture to just under boiling point over medium-low heat, whisking occasionally to dissolve the sugar. Remove from the heat and let cool to room temperature, again whisking occasionally (it might form a small bit of skin on the surface, just whisk to dissolve it). Refrigerate overnight. See notes 2-3, regarding the ginger ice cream. For the roasted pears: Peel and core the pears and chop into .5cm cubes (doesn't have to be exact, just remember the molds aren't very big and you don't want big mouthfuls of pear; also they don't have be exact cubes!). Place the pear pieces, lemon juice and caster sugar into a bowl, give it a stir and let sit for about 15 minutes to bring out the juices. Meanwhile, preheat the oven to 180C. Line a baking sheet (one that's big enough to spread the pears into an even, single layer) and line with baking paper. Add the remaining ingredients to the pear mixture and stir together until all the pears are coated. Transfer the pear mixture to the prepared baking sheet and bake for about 20 minutes, stirring once or twice. Keep your eye on it; you need to have quite a bit of thick, sticky pear sauce, but if you bake it too long, the juices will start to sort of evaporate and there won't be any lovely sauce to swirl through the ice cream. Let cool completely to room temperature, or better yet, refrigerate overnight, before swirling through the ice cream. See note 4, regarding roasted pears. For the caramelised white chocolate: Preheat oven to 130C. Line a large baking sheet with baking paper, or use a very clean and completely dry baking sheet. Coarsely chop, or break, the white chocolate. Scatter the chocolate into a single layer on the prepared baking sheet and place into the oven. Roast the white chocolate for about 45 minutes - 2 hours, stirring and smearing the chocolate, with a spatula, into a single layer every 5-10 minutes (ensure the spatula is very clean and completely dry). Don't worry if the chocolate looks lumpy, dry and crumbly at times - it will smooth out as you stir. Just keep stirring the chocolate every 5-10 minutes and respreading it out into a thin layer as best you can. If you use a baking sheet lined with baking paper (like I had to), it's going to be hard to stir without the paper moving all around, but again, do the best you can. Continue cooking, again, stirring every 5-10 minutes, until the chocolate is as dark as you like. Maybe the color of peanut butter, or a rich toffee, or dulce de leche. Transfer to a bowl. Sprinkle over the sea salt to taste, and add coconut oil (I used as less as possible to avoid a strong coconut oil taste; I believe I used about 3.5-4 tablespoons). Pour into a jar or airtight container to store. It will harden as it cools. For the toasted macadamias: Preheat oven to 180C. Line a baking tray with baking paper. Finely chop the macadamias and scatter into a single layer on the prepared tray. Place in the oven and bake for 7-10 minutes, stirring once or twice. Keep an eye on them so they won't brown too much; just bake until they are lightly golden. Cool completely. Store in an airtight container. ASSEMBLY TIME! Once the ice cream mixture has chilled overnight, churn the mixture in an ice cream maker (according to manufacturer's instructions). While it's churning, have your ice cream / popsicle molds at the ready, as well as a couple spoons, a butter knife and the roasted pears. When the ice cream has reached a soft-serve consistency, quickly transfer the ice cream to a freezer-safe container. Using a spoon, scoop a layer of the ice cream into the ice cream molds. With another spoon, scoop up some of the pears (make sure you get some of the pear sauce), and sprinkle on top of the ice cream layer in the molds. Don't completely fill the layer with pears, just a few pear pieces here and there will do. Use the butter knife to gently swirl through the pears and sauce. Being sure to work quickly, repeat the layers until you reach the top of the molds; end with a layer of ice cream. Insert the popsicle sticks, and, if using the Silikomart molds, scrape off the excess on top of the molds with the flat top (not the sharp side) of the butter knife to get an even top (or whatever you have that can scrape off the excess ice cream). If just using regular popsicle molds, follow the appropriate instructions. Transfer to the freezer and set for at least 5 hours - the longer the better. Store leftover ice cream in a freezer-safe container in the freezer, and feel free to swirl through leftover roasted pears. While the ice creams are setting, prepare the caramelised white chocolate magic shell. Let it cool completely before dipping the ice creams into it. If you've already made the caramelised white chocolate and it's firmed up, simply rewarm it but let it cool completely before dipping the ice creams. While the magic shell cools, prepare the toasted macadamias and set them aside to cool completely. When the ice creams have completely set in the freezer, carefully pop them out of the molds and place them on a small baking paper-lined tray or plate and place them back in the freezer until ready to dip. Get your workstation ready - pour the caramelised white chocolate magic shell into a glass that is tall and wide enough to quickly and comfortably dip the ice creams. Again, be sure the magic shell is completely cooled to room temperature. Have the toasted macadamias ready to quickly sprinkle over the magic shell. Line a baking sheet with baking paper - this will be what you will place the ice creams on once you've dipped them. When ready to dip, take one ice cream out of the freezer at a time and quickly dip it into the magic shell in one go. Gently scrape off the excess and place on the prepared baking tray. Quickly sprinkle over the macadamias before the magic shell starts to harden. Repeat, quickly, with the remaining ice creams. Place the finished ice creams in the freezer for a couple of hours to completely set. You can enjoy immediately, once the magic shell has hardened, but the ice cream may be a little melty. Store in the freezer for up to a week or so. See note 5, regarding leftover magic shell. 1 You could use 2 tablespoons very finely grated fresh ginger if you can't find the Ginger Juice (feel free to strain the mixture just before placing in the refrigerator to remove the pieces of ginger). 2) If you are using a set of the Silikomart molds, which will make 4 ice cream bars, you'll have heaps of leftover ice cream. Feel free to halve the recipe, if desired. 3) You can use your preferred popsicle molds for this as well (will not work with a Zoku quick pop maker, however). 4) Note that I didn't quite measure *exactly* the ingredients for the roasted pears, and it isn't really necessary to do so. I basically wanted the cinnamon, vanilla and bourbon to really stand out, and to have a bit of juice to swirl around with the pears. 5) Note that you will have leftover magic shell. Keep it in the refrigerator for around a week and rewarm as necessary to pour over leftover ice cream. 6) This recipe will make 4 classic-sized Silikomart mold ice cream bars, but there will be plenty of leftovers to make more, should you have more molds. Of course, if you're using a different type of popsicle mold, the yield will be different. Keep in mind, as stated in my blog post, you actually don't even need to use molds of any type - just make the individual components of the recipe (in a freezer-safe container, layer the ice cream and roasted pears, swirling the pears through as you go up the layers, then freeze until firm) and serve by scooping the ice cream into bowls, drizzling over the caramelised white chocolate magic shell and sprinkling with the toasted macadamias. 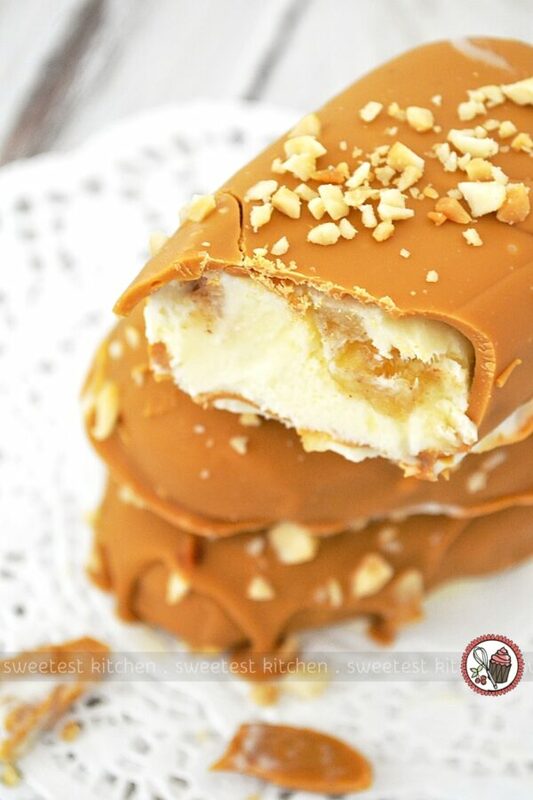 These ice cream bars are perfect! I would love to savor these in the hot days!